Number five embodies the qualities of being dynamic and intellectual, operating under freedom and independence, and being under the flux of change. 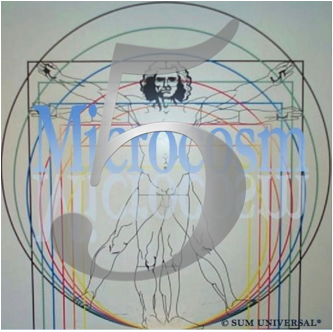 Five is the symbol of the human being, it stands for the phenomenal world in its entirety—five senses and the forms of matter open and responsive to sense-perception, it is the symbol for the microcosm. Five forms of energy: mechanical, heat, electrical, chemical, and light energy and five different forms of nucleotide bases, which are the building blocks for DNA and RNA: adenine, cytosine, guanine, thymine, and uracil. The human species' gene pool is fabricated within 23 (2+3=5) chromosome pairs. The chemical element that correlates to number five is the metalloid (semi-metallic) boron, which divides the metals from the non-metals and has both metallic and non-metallic properties. The element can appear in different physical forms called allotropes, which have different physical and chemical properties. One form of boron consists of clear red crystals, another of black crystals with a metallic appearance and another form as a brown powder with no crystalline structure.